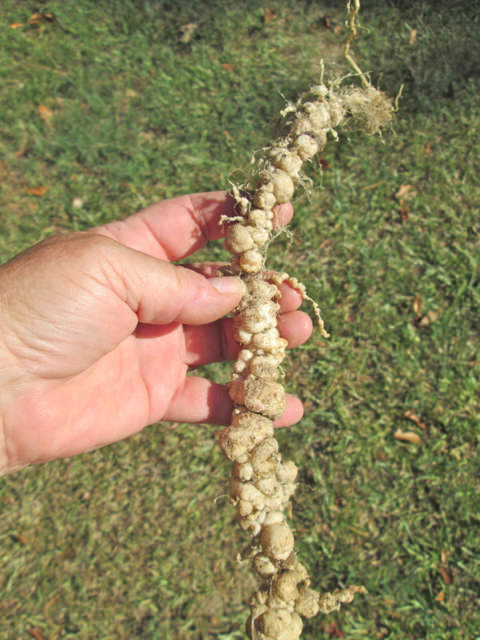 Southern Root Knot Nematodes. They invaded my garden about five years ago, coming in (I think) on a truck load of soil I had delivered while building new raised beds. They’ve gradually spread to other beds, probably from a combination of water drainage and hitchhiking on tiller tines, shovels and hoes during the time I didn’t know I had them. And I've been battling them ever since in about two thirds of the sixteen 4'x18' raised beds that make up the veggie garden. They are microscopic worm-like organisms that invade plant roots, multiply and disrupt the flow of water from roots to upper plant. The result is stunted growth and little plant output. Plants look thirsty but watering doesn’t help too much; maybe just a temporary boost. Infested vegetable plants grow more slowly than neighboring, healthy plants, beginning in early to midseason. Plants produce fewer and smaller leaves and fruits, and ones heavily infested early in the season can die. Plant as early as possible in spring and as late as possible in fall. I learned that in soil temps below 64, nematodes can’t function so it's best to plant resistant stuff as late in the fall as can be safely done and really early in the spring to get a jump on the nematodes. They don't infect older plants as hard as they do young ones. Because of that, it also pays to grow really large transplants if possible. Get lots of organic matter into the soil because high water retention in soil helps fight nematode attacks. I mulch with leaves raked in the fall and till them in when the crop’s done. One extension service suggested tilling the infected beds every ten days in the summer as the hot sun will kill eggs brought to the surface. While doing this, also keep the soil moist to induce egg hatch and keep weeds out so that any newly hatched nematodes have nothing to feed on. Starve ‘em! I did this faithfully the summer of ’16 and it seemed to reduce the ’17 population so I did it again last summer. This spring I’ll see if it helped. Thickly planting French marigolds and mustard several times in one season and tilling them in disrupts the reproductive cycle and it did help a little. They have to be French marigolds (species Tagetes patula) as some other marigold species can attract more nematodes. I cheated by planting them along just the edges of one bed and although I’ve read where you have to plant the whole bed for it to be effective, what I did seemed to help a bit. I've read where sowing mustard and then tilling it in several times in one season disrupts the reproductive cycle. It seemed to help a little and mustard seed is really cheap at the feed & seed store. The mustard’s volatile oils knock them back enough that the next year you can plant other stuff before having to repeat the process. Territorial Seed has in their Brassica Cover Crop section a ‘Mighty Mustard’ that has high levels of volatile oil to act as a natural soil fumigant. I haven’t tried it yet. Plant summer cover crops and till them in. In ‘16 I grew some sorghum in one bed just to starve the critters. No more of that as it was a mildew and aphid magnet. Late last spring I planted two beds with Sunn hemp which is supposed to have a somewhat nematocidal effect when chopped up and tilled in. We’ll see this year if it had any effect. Good garden sanitation practices. Thoroughly clean all tools used in infected areas. Since I have something growing in the garden all year long I have to pick and choose my battles. Beds that show big nematode damage get targeted for war. There hasn’t been any damage in the fall planted veggies due to the colder weather. I’ve read where RKN don’t bother corn, onions. So far that’s true. There’s currently some research going on exploring the use of molasses, of all things, against nematodes. Something about a diluted spray. If I find any more about that I’ll post it. It's WAR, I tell ya! There’s also one I had from U. Of Florida but I can’t find it right now. I forgot to add that I have tried soil solarization but gave up on that. It's a pain in the but and Lord knows how many good things in the soil it kills too. Besides, it will only solarize about the top 6-8" so if one tills or digs below that, nematodes are brought to the surface to start all over again. I use a 16" tine broadfork on the beds a lot so there goes the neighborhood! Best of luck! From what some other Tvillers have shared it sounds like it’s an uphill fight and the hill just gets steeper and steeper. It's war, I tell ya! I guess you just have to be resigned to the fact that they're there and do whatever you can to beat them into temporary submission. That's where I am at this point; the hill climbing has leveled off but it takes energy to keep from sliding back down! I just mow my winter rye and plant through it live, leaving the tomato roots surrounded by RKN trapping rye roots. Now that's an interesting thought. Now that my tomatoes are in buckets, the beds where they used to be are now occupied by other stuff. You know how nature abhors a vacuum... garden mission creep! I wonder how planting cucumbers, peppers, okra, etc through rye would work. Too late for this year as I've tilled it all up but maybe next year. I'm thinking though that roots like carrots and turnips might not like the competition. As someone who has dealt with nematode infested soil in my garden for around 40 years I have found a few things that do work. Add lots of organic matter and add peat to the soil as it will also help retain moisture. If you can till in some fresh horse manure it seems to cause a definite drop in nematode populations. For tomatoes I have found that grafting onto good nematode and fusarium resistant root stock is the best way possible to grow healthy tomato plants with the least nematode damage. Heavy mulch that cools the soil and also maintains the moisture level is essential especially for some nematode susceptible crops like cucumbers and okra. If the soil is very sandy then it is almost impossible to control nematodes as even nematode resistant varieties will sometimes be affected by them. This is purely anecdotal but it seems that where my worm populations are the highest in my garden are the areas with the least nematode problems. This could be just the presence of the worms where the most organic matter is or it could be that where soil is conducive to active worm populations is that soil with high worm populations is not good for RKN. Good luck because if my experience is any indicator you are in for a long and never ending battle; but one that you can win with persistent soil building and mulching. Bill, thanks for the advice! Add lots of organic matter and add peat to the soil as it will also help retain moisture. But will that raise the pH too much? If you can till in some fresh horse manure it seems to cause a definite drop in nematode populations. The guy who owns the pasture next to the garden has brought his horses there for the summer. I just have to go shovel it up. Assuming this would go into a fallow bed to age. Yep, a never ending battle. I'm curious to see how the beds sown with hemp last summer do this year. The extra tilling under the hot summer sun has seemed to help too but I worry about disturbing the soil structure that much. For the best results with horse manure you want to use it as fresh as possible but not during the summer growing season. I found that tilling in fresh horse manure (not composted) in the fall and letting whatever is in it that bothers nematodes work resulted in far fewer problems with them the next year. You will definitely have to deal with more weeds unless the pasture has been sprayed with 2-4-D or some other pasture herbicide. In that case definitely don't use manure from those horses. I got mine from a guy who stabled horses for training and didn't let them out much in his pasture which he didn't spray. The bad part was shoveling it out of the stalls. It didn't have too many weeds but a lot of oats, rye, corn and wheat came popping up. Peat will not raise your ph but it may lower it a bit as will pine bark fines and cottonseed meal. Three things I add every time there is space in my beds for more. The combination has given me soil that is loamy, rich, well aerated and full of wrigglers with only minor nematode problems. 30 years ago it looked like I was pulling potatoes when I pulled up most things like tomatoes, okra, cucumbers and squash. It took some years of constant amending to get my soil where it is now. I can no longer use cow or horse manure because of my high phosphate levels from adding them to my soil for so many years so I use a bit of chicken manure when I can get it. Add lots of organic matter and add peat to the soil as it will also help retain moisture....Heavy mulch that cools the soil and also maintains the moisture level is essential especially for some nematode susceptible crops like cucumbers and okra. If the soil is very sandy then it is almost impossible to control nematodes as even nematode resistant varieties will sometimes be affected by them. I've been mulching with leaves for the past four years, having used wheat straw before that, which got too expensive. Leaves are free and I have a ton of them. It all gets tilled in afterwards and slowly the sandy soil is improving. What compost I make is not enough to cover all the beds so I use it to amend each planting hole and that is helping too. I agree, it will be a never ending battle but persistence pays off. I learned the hard way how fast very sandy beds will eat up organic matter. The more often the beds dry out the faster the bed will return to its sandy state. Finding cypress mulch was the single most effective thing I found in preventing the quick return to sandy soil. I keep my beds heavily mulched year round and only remove the mulch between planting’s to add amendments and turn the beds. I tried a multitude of mulches like grass clippings, straw, paper, and leaves and none of them were very effective at keeping the soil moist and cool enough. Regular additions of cottonseed meal to attract soil building wriggles is probably the next most important. The first sign that the soil needs more organic matter and cottonseed meal is a decress in the earthworm population. Worms don’t particularly like dry sandy conditions but RKN certainly do. The cottonseed meal does three things at once to improve soil by providing fertilizer, adding organic matter and attracting wranglers. Adding peat is another essential thing in quickly reducing the sandiness of a bed. It really improves moisture retention. Another key ingredient is bark fines. In a sandy bed it is very helpful to add some organic matter that won’t breakdown too rapidly and bark fines do that. They are also fairly cheap and readily available from nurseries and big box home improvement stores. I gave up on growing them in south Florida's extreme nothing but sand soil. We are so infested you would need 100 marigolds per foot! I now grow in pots with potting mix, not potting soil, and the thick plastic bag the potting mix came in is placed between the pot and the soil. It's a barrier to nematodes, they can't crawl into the pot through the drain holes because the plastic is there. Easy peasy, problem completely solved. My 47 Earthboxes have a solid bottom and the water drainage area is above ground,so nomorenematode issues. It turned my 3 month season into an 8-9 month one instantly. The idea is: grow and don't let them in. Photo showing the barrier under the pot. That looks like a fabulous and effective way to outwit the nematodes Marsha. For me easy peasy. Thanks. Wow! That is a lot of earth boxes.